Data Lakes emerged to meet the need to economically harness and derive value from exploding data volumes, which can reveal value in new insights from unknown or underappreciated data, new forms of analytics, corporate memory retention, and data integration optimization. Now the proliferation of new data sources and forms of analytics require a new Data Lake design pattern to augment traditional design patterns. Get faster time to value with less risk to your organization by implementing a data lake design pattern. Data and analytics is inherently complex. Avoid becoming one of the project casualties that fail in the pilot and experimentation phases by making Teradata Consulting your trusted partner. Kylo is an open source enterprise-ready data lake management software platform for self-service data ingest and data preparation with integrated metadata management, governance, security, and best practices. Kylo was built using the latest open source capabilities such as Apache® Hadoop®, Apache Spark™ and Apache NiFi™. This open source SQL-on-Hadoop query engine runs interactive analytic queries against data sources of all sizes. Through a single query, Presto allows you to access data where it lives, including in Apache Hive™, Apache Cassandra™, relational databases or even proprietary data stores. A compact, fully-integrated environment for data lakes and other designs that require low-cost data storage, this versatile platform enables a mixture of Teradata and Hadoop nodes for your workload requirements. 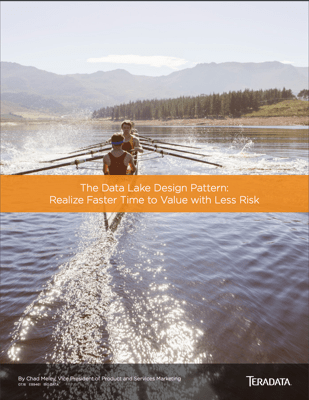 Discover the faster time to value with less risk to your organization by implementing a data lake design pattern. As the trusted advisor to the world’s leading data driven organizations, Teradata helps you realize maximum value from your Data Lake initiative by ensuring critical capabilities and design principles based on best practices. Let's Find the Value in Your Data Lake.